The name Helius has been associated with quality tonearms for many years; Helius tonearms have always been built from the ground up by a physicist and engineering graduate who also a music lover. The first time I saw Helius’ new Scorpio tonearm was at the 2009 Rocky Mountain Audio Fest. It was set up on a Clearaudio turntable and the sound in the room was very nice. When I asked about it, I was told that for some time, Helius had been working on a new version of the Scorpio tonearm, the Scorpio 4. The Scorpio 4 is their new entry level tonearm, and the forth version of the Scorpio. Although the price limits some of the design features of some of their more expensive arms, the Scorpio is a good example of trickle-down engineering. The one area Helius set out to make as few compromise as possible was with the bearings. They feel their bearing assembly is significantly better than anything else on the market in the same price category. So, let’s see how they did. The function of a tonearm is to control and damp out vibration and energy that the cartridge creates as the stylus vibrates in the vinyl groves. The performance of the arm/cartridge is determined by the inertia of the entire vinyl playback system. Thus, the relationship between the turntable, tonearm, and turntable is extremely important. This makes the setup of a tonearm very critical to the sound of your system. I am thankful to say that the setup of the Helius Scorpio 4 was very straightforward. The setup directions were easy to follow and Helius provided the basics you need for the setup. The design of the tonearm collar made it easy to get a very secure mount of the tonearm to my Clearaudio Anniversary Wood CMB turntable. The fixed head shell makes it easy to obtain a cartridge-to-tonearm connection that is very stable. The Scorpio 4 looks nothing like the previous Scorpio tonearms, or for that matter, any of the other Helius tonearms. In fact, I don’t know of any tonearm that it looks like, but on the whole it is a very simple-looking arm, and performs in a very simple way. Now, before you take that as a negative statement please remember that in audio, as most other things in life, I believe in the KISS principle; you know, “Keep It Simple Stupid.” If you look at the two cross section illustrations you will see that, internally, it’s not as simple as it looks, but it is still very simple to setup and use. It is available in both 9” and 10” versions and uses single-strand silver wire. Mounting geometry is identical to the Aurora and Omega arms making a straight upgrade delightfully easy. A feature borrowed from Helius’ more expensive arms is the incorporation of the cue device into the main pillar. Geoffrey Owen, designer and owner of Helius Designs, said, “We started by defining what single parameter constituted the most fundamental requirement that could not be sacrificed if performance expectations were to be met. We decided the primary objective should be to sink the unwanted energy through the bearings and out into the turntable plinth. 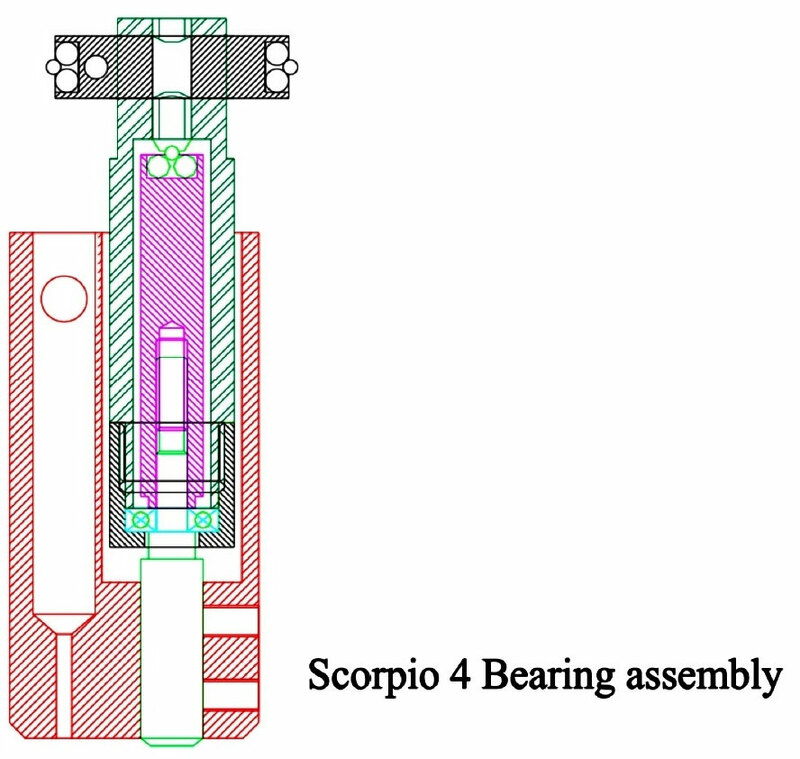 The arm tube assembly of the Scorpio belies a simplicity that does not reflect the quality of the engineering needed to efficiently damp and transfer vibration into the largest possible sink volume. One last thing, the Scorpio 4 is a medium-mass tonearm that is slightly closer to a high- mass tonearm. This needs to be kept in mind when picking cartridges to use with it.